The year-to-date cash-flow based general government balance worsened further in July, translating into a deficit of HUF 1,491 billion. Considering the monthly change, the budget deteriorated by HUF 70.5 billion. When it comes to the officially planned cash flow-based target, the July deficit exceeded by 9.6%. 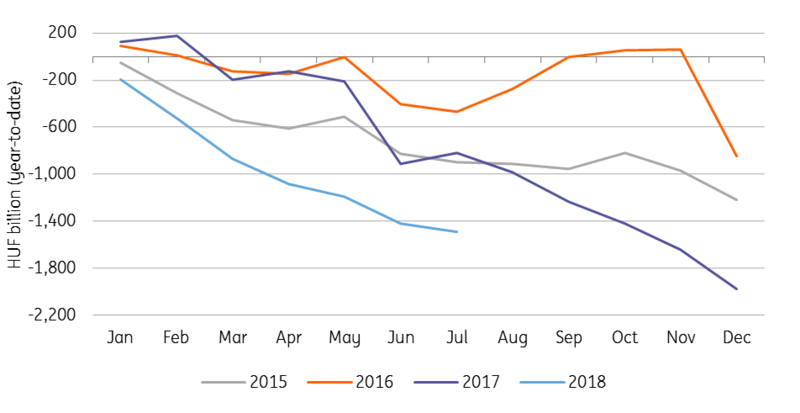 The main driver behind the deterioration has remained the same - as the government continues to pre-finance EU projects while the actual inflows still face significant delays. According to the finance ministry, the government has spent HUF 1,309.4 billion on EU projects in the first seven months of 2018, so 20% more than a year ago, meanwhile receiving only HUF 162 billion inflows from Brussels. This means that Hungary didn't receive anything from the EU in July, which isn't surprising but the money could come in as late as 4Q18. Besides the pre-financed EU projects, road and hospital constructions have also taken their tolls on the expenditure side. When it comes to revenues, we only see positives. Revenue from value-added tax, personal income, and payroll taxes both exceeded 2017 figures, contributing to the underlying improvement of the budget. In the coming months, we see this trend continuing, as the favourable processes in the labour market don't seem to be ending anytime soon. The pressure is still on the government 's debt management agency (AKK) and finance ministry to finance the significant gap caused by the EU projects. As a new stopgap measure, the AKK has just turned to the retail sector, raising the yields by 50 basis points up to two years maturities of retail bonds. However, as the underlying trends are still better than expected, we could see even a lower Maastricht deficit than the planned 2.4% of GDP.